The novel recounts the last day in the life of Alexander, a journalist working at the fictitious “Athens Herald”. Alexander suffers from a rare neurological disease caused by a tumor in his brain. A result of this disease is that he cannot see his reflection in the mirror, or his image in photographs or videos or any other depicting media. Alexander lives with this odd predicament for three years, until he is told that the growth of the tumor does not leave any other option but to surgically remove it. The only trouble with the operation is that Alexander’s memories will have to be removed and thus, when he awakes from anesthesia, he will remember a completely different life; he will in fact be, for all intents and purposes, another person. Alexander’s last day will be full of strange events. As he prepares to leave his apartment, shots are heard and as he steps out into the street, he finds out that someone had been shot and killed only a few meters away from the door of his apartment block. As the story develops, Alexander will come across many other incidents that make him doubt his very existence. A pivoting point in the book’s narrative is an inconspicuous bookstore in central Athens. Alexander is the veritable bookworm and this bookstore had been his favorite hangout ever since he was a young boy. Deciding to pay a last visit there, he is taken on a tour by the bookstore’s elderly proprietor – Uncle Aaron – who claims that the bookstore is an “infinite one”. Purportedly, the bookstore is built as a three-dimensional Möbius strip (or “Klein bottle”), a mathematical entity with neither a beginning nor end. During the tour, the bookkeeper will reveal a well-kept secret about the sinister role of his father during the German Occupation of Athens in World War II; and the reasons for the demise of Alexander’s Greek-Jewish family Finally, Uncle Aaron will gives Alexander a book to read. 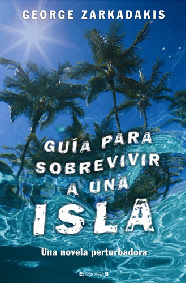 The title of the book is “The Island Survival Guide”. As if there were two Alexanders, like opposite reflections on a mirror unable to see each other, the novel’s plot splits in two. Alexander collapses in a hotel lobby after a gargantuan lunch with a physics professor about to embark on a perilous experiment in particle physics. And a colleague of his at the Athens Herald, named Sophia Roma, will begin an investigation into who Alexander really was, and what was his connection to the mysterious Mina. The answers will be found in a strange book, with the peculiar title “The Island Survival Guide”. The Island Survival Guide was written as a cybernetic novel. Read here what a cybernetic novel is. Philosophical speculation plenty with mystery and abundant literary references are revealed in the narrative world created by George Zarkadakis in “The Island Survival Guide” (Ediciones B), a thriller which allows the author to establish a complete drama which unfolds with agility and freshness. George Zarkadakis can be compared to a Kurt Vonnegut and a Haruki Murakami. …Dream and hallucination will create inside “The Island Survival Guide” (Kedros) infinite replicas of the real story of the novel, which will thus become something akin to a Russian Babushka (each doll containing a smaller self, or contained inside a bigger replica). The external and the internal planes function as one in Zarkadakis’ novel, who manages to speak about the historical guilt of the Second World War and relate it to the weight of the contemporary political responsibilities, avoiding ideological stereotypes (e.g. the Russian businessman turns out to be a child of the Holocaust). At the same time, the author posits pertinent questions on the preservation of memory and the writing process in an age where everything is rediscovered from the beginning, and no identity (scientific, political, social, historical or artistic) can be taken for granted. The combination of all this is not easy: it presupposes economy of narrative force, craftsmanship of composition, and the ability to balance a varied repertoire of writing techniques and tools. I have to say that Zarkadakis has it all, and delivers an excellent novel, perhaps his best to date.